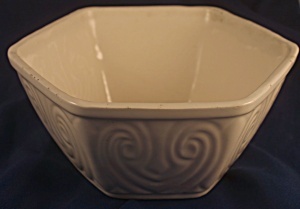 Six-sided white bowl from Ungemach Pottery. Has incised decorations around the edge. 6 3/4 inches across, 3 1/4 inches tall. Some small rim chips (see photos).